Paris, December 1941. The skies are cold and grey, there’s snow in the air, and people are walking the streets bundled in coats, near-doubled over to keep the cold at bay. It’s tense, too. Nearly a year and a half since the Germans invaded, covering the city in their harsh red and black swastikas, every day seems to bring news of another awful atrocity committed by the occupying forces. Plenty of people have fled Paris already, and Eleanor Gorton Clarke doesn’t blame them. Acclaimed American writer, Eleanor, has lived in Paris for nearly twenty years, and she’s furious at the Germans for what they’ve done to her beloved city and its people. But Eleanor’s life is in Paris and she’s determined to stay there, until one fateful day when she wakes to the news that Japan has bombed Pearl Harbour. Eleanor sees the writing on the wall. Although she feels more French than anything else, she still has American citizenship, and with all signs pointing to America’s entry into the war against both Japan and Germany, Eleanor realises it will only be a few days before the Nazis come for every American still in Paris. Reluctantly, her heart breaking, she joins the hordes of people fleeing the city. Although Eleanor’s journey to America and safety by way of Spain, is perilous, she’s optimistic. But as she and a few fellow escapees creep through the fields of Burgundy one night, disaster strikes: Eleanor loses her way in the dark, and comes face to face with two Nazi soldiers and their enormous rifles. In the chaos that follows, one of her fellow escapees kills the soldiers and saves Eleanor’s life – and just like that, Eleanor and her mysterious rescuer, Henk, become marked people. Thrown together and forced on the run, Eleanor and Henk don’t get along at first. She is a well-to-do American, and he is an Austrian Jew with more than a few dangerous secrets. But as the ruthless German detective on their trail begins to close in, the pair must become allies to survive. As they work together to outwit Captain Bauer and plot their route to safety, their mutual dislike morphs into a smouldering attraction. But can they escape France unscathed? Will they make it to Spain? And can their fledgling relationship survive when Henk’s bombshell secrets are finally revealed? From Australian screenwriter and playwright J.R. Lonie, The Woman from Saint Germain is an outstanding Second World War novel. With Eleanor and Henk running from the Nazis for most of the book, the plot is fast-paced and suspenseful, and Lonie’s clever use of alternating perspectives ratchets up the tension. The story is told in turns by Eleanor, Henk and Captain Bauer, giving readers a compelling insight into the minds of both the hunter and the hunted during their frantic cat-and-mouse chase across the French countryside. Eleanor is an interesting if somewhat flawed heroine – vulnerable and yet fiercely independent, loving at times, cold at others. These contradictions can make her hard to like, but ultimately serve to make her more human, more authentic. Neither is the German detective what you’d expect: weighed down by the ghosts of his past, he’s far more complex than the usual textbook wartime villains. And Henk with his mysterious, shadowy past is an enigma, one that remains tantalisingly unresolved until the very end. Lonie’s research is excellent, revealing some intriguing aspects about the intricacies and dangers of life in Nazi-occupied France, and about the treacherous paths people needed to take if they wanted to escape. As Eleanor and Henk cross France, Lonie paints the countryside and towns in the kind of vivid detail that sweeps you along on their journey. Their race to escape becomes yours – terrifying, relentless, desperate. A thrilling and perfectly paced Second World War tale, with lots of astute observations about human nature, we highly recommend The Woman from Saint Germain. 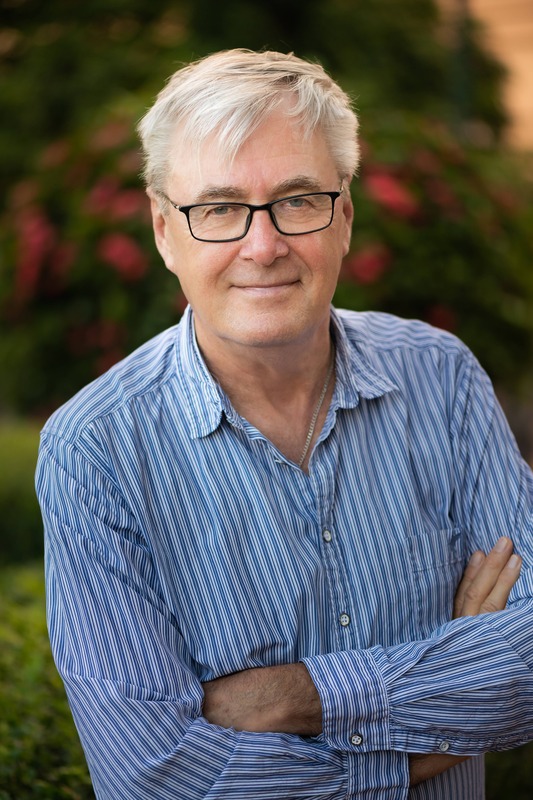 J.R. Lonie is otherwise known as John Lonie, a screenwriter, playwright and script editor whose credits include some of Australia’s top TV dramas and films. He was head of screenwriting at the Australian Film Television and Radio School for seven years, during which he also co-wrote the feature film Kokoda. He is one of the writers on the popular television series, A Place to Call Home. He is presently working on his next novel. He lives in Brisbane. Buy a copy of The Woman from Saint Germain here.